Space saving size and light weight. Available for washing, showering and bathing. Splash proof design (IP24) isolates electricity from water. Fire retardant materials and high pressure tolerance design. 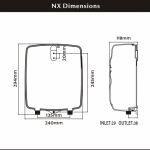 360-degree multi-stage temperature knob makes adjustment easier. Pressure relief system prevent harm incurred by excessive water pressure at 7 kgf/cm2 ± 0.5. Auto cut-off of power supply device averts damage caused by abnormally high temperature. 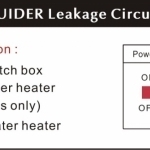 Water overflow system equipped in heating element tank avoids malfunction when heating with short water supply. 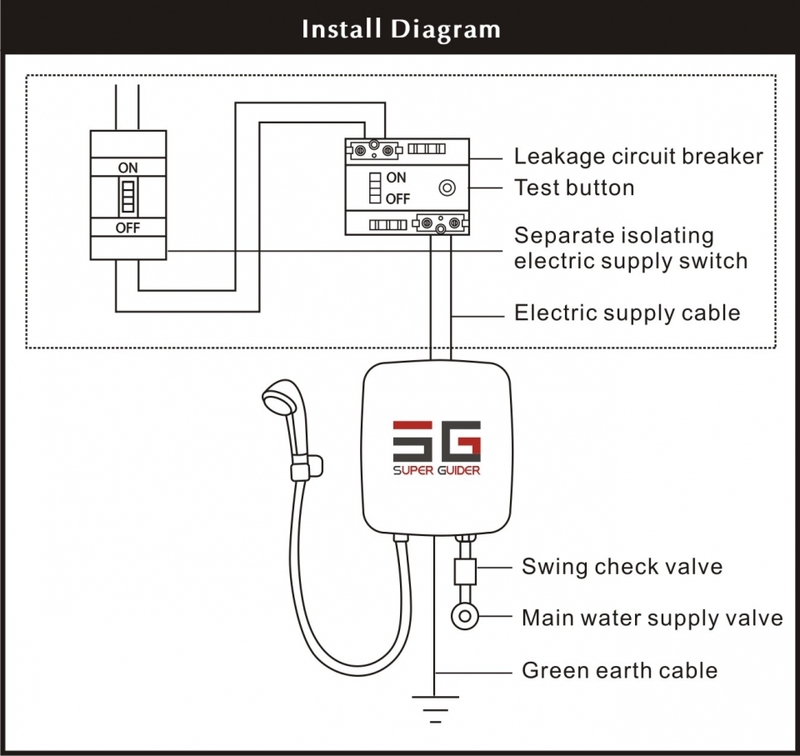 There are 2 installation methods: single point usage and multipoint usage. (Refer to Diagrammatic Views on Page 6, 7) Note: former option can lower the possibility of malfunction and extend the life span of unit. 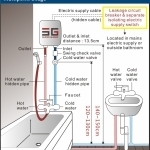 Install cold water valve and a swing check valve in the supply pipe work to prevent back flow. Link the shower head and the water heater with the hose provided. 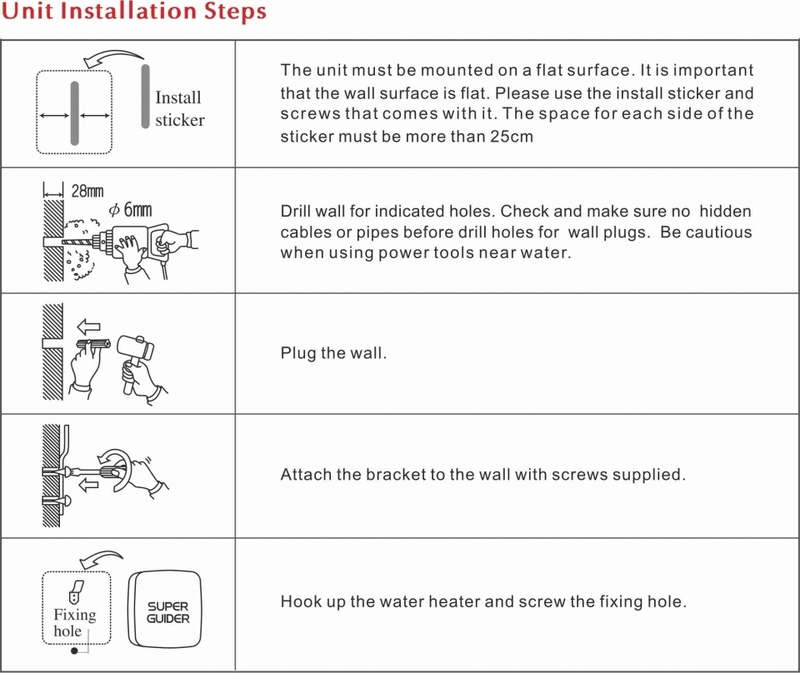 For first time use after installation, please allow water to flow into water heater so that the water heater contains water before electricity is connected, at the same time, it can help to clean impurities from pipe line. Install No Fuse Breaker (20A/30A/40A/50A) in accordance with amperage required for the model to prevent electrical overloads. 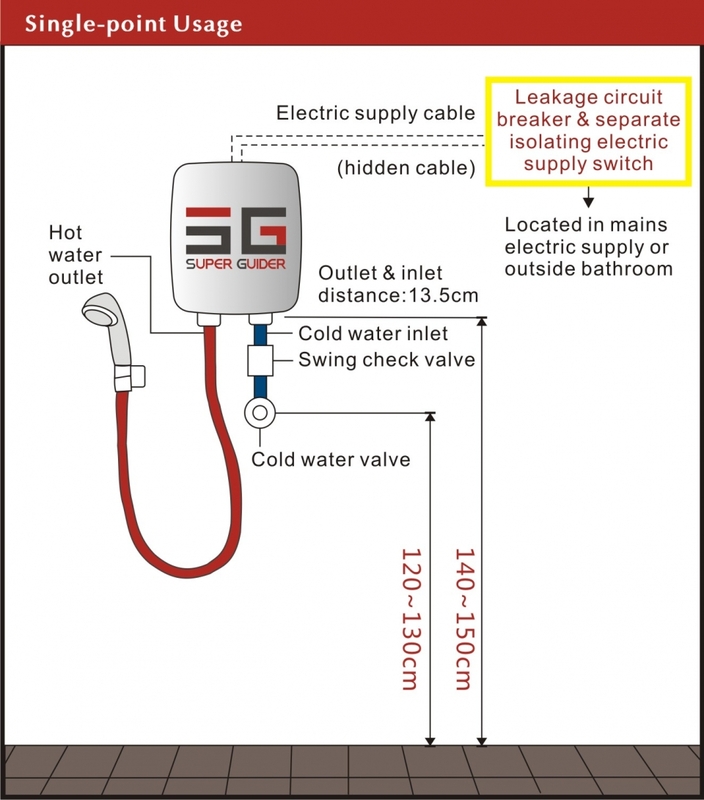 To comply with Electrical Regulation, it is highly recommended to install Super Guider’s leakage circuit breaker in switchboard or next to water heater. Power cord entry points are on the top and on the side of the base brim of water heater unit, which needs to be cut off to extend out the cord. 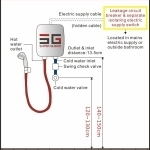 Route the cords (4mm²/6mm²/10mm² standard cords according to model for safety purposes) into water heater and connect the earth cord to terminal “E”, neutral cord to terminal “N”, live cord to terminal to “L”. 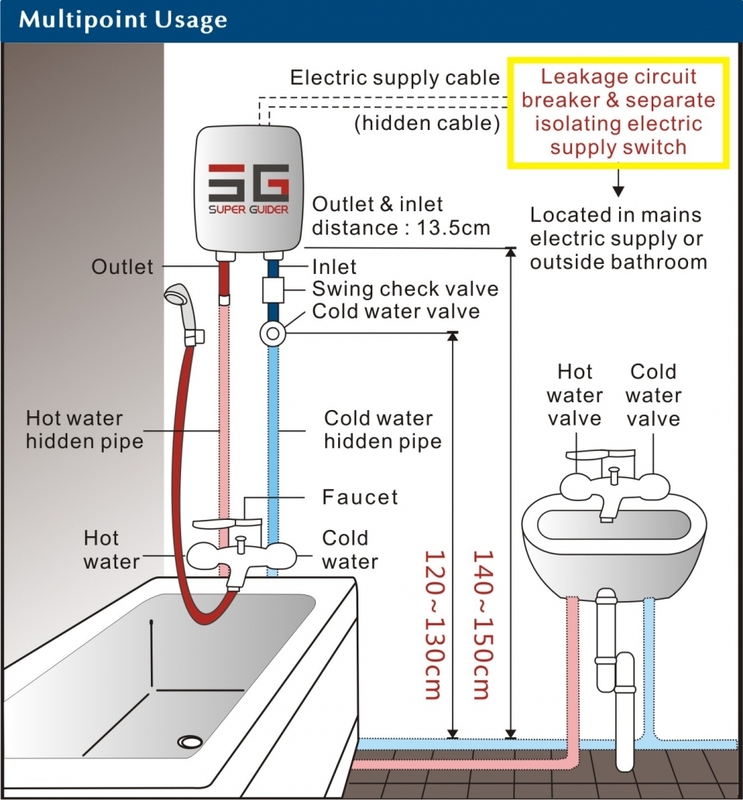 NOTE: the water heater must be earthed. Turn on electric supply at the isolating switch. 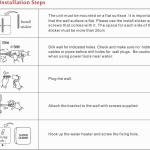 Make sure it is flat on the wall surface that you want to install the water heater on. Install it using the install sticker and screws provided. Space for each side of the sticker must be at least 25cm. Make sure no cables or pipes hidden in the wall. Drill the wall for indicated holes. Be cautious when using power tools near water. Screw the bolts provided into the holes on the wall. Attach the bracket to the bolts with screws supplied. Hook up the water heater and nail on the fixing hole. All electrical installation should be carried out by a qualified person. 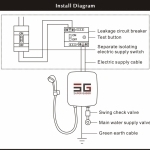 Isolate electricity and water supply before proceeding with the installation. Water purification before installation could extend the life span of water heater. 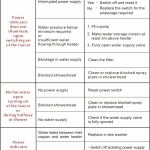 The water heater is not suitable for installation in places subject to frosty or freezable conditions. However, do not switch on if there is a possibility that the water in the heater is frozen. 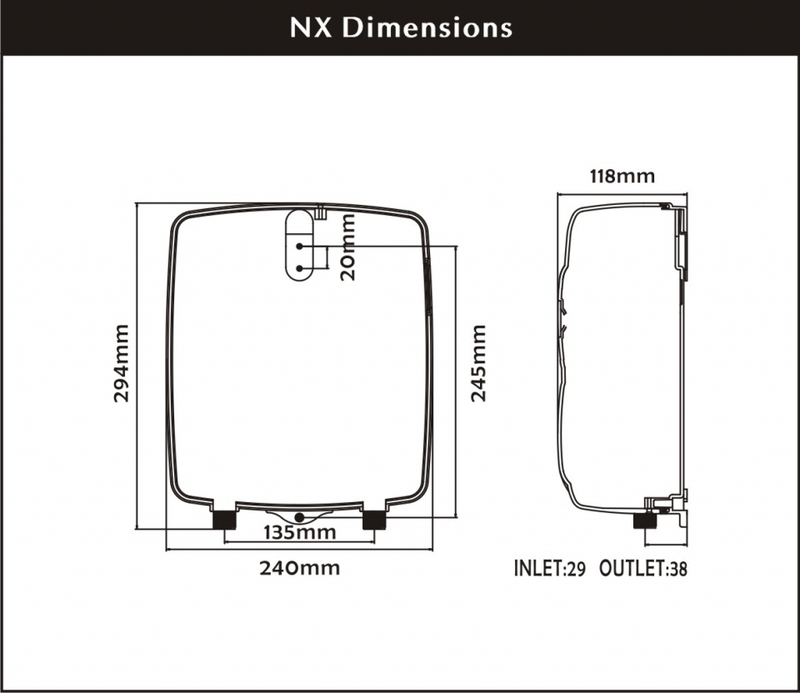 Should there be any problems after installation, please switch off the power, contact the distributor you purchased from or contact any qualified person. Meanwhile, do not undo the unit by unqualified person. In the case of cord damage, new cord must be acquired from the manufacturer or your distributor. The water heater is not to be used by children or people with reduced physical, sensory or mental capabilities, or lack of experience and knowledge, unless they have been given supervision or instruction. Replace with new water heater every 5 years for best performance. Clean shower head regularly to prevent clogs as well as for hygienic. Regularly test the leakage circuit breaker by turning on power and press "test” button; breaker works fine if it auto switches to OFF. Remember to switch back to ON afterwards for hot water. Turn off isolating switch before cleaning and maintaining so as to isolate electricity and water supply. The use of abrasive or solvent cleaning fluids is prohibited and it is recommended that the water heater and accessories are cleaned using a soft cloth. 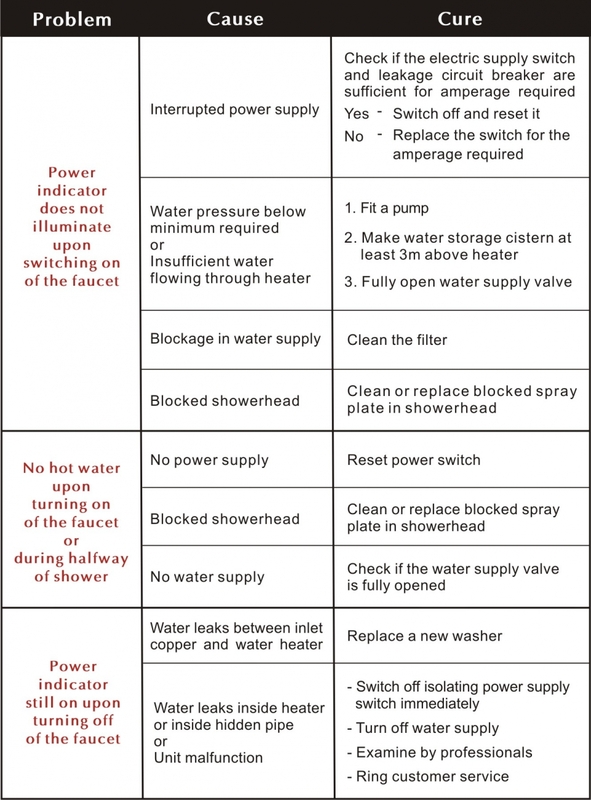 Turn faucet to hot water side until power indicator light on. Simply turn off faucet or turn to cold water to disconnect power. Plastic smell might appear temporary in water at first use.